What is this crap? Am I a spokesperson to AirAsia? Nope. I am not. I am just a newspaper reader following this news today. Am I an AA frequent flyer? Not really but I do fly AA occasionally. So this new ruling will impact me on my next flight, if I fly AA again. I do welcome the approach of mobile check in, less paper, less queue and you can arrive a little later than typical 2 hours prior to the flight schedule. Glad that my phone is supported. 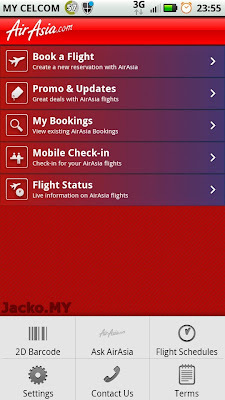 So I download and install the mobile apps to learn how to mobile check in. Looks good with quite a few features bundled in this latest version of apps. Got it? 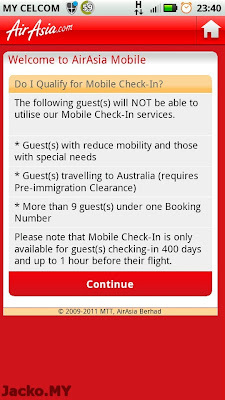 Now make sure you buy your tickets at least 401 days before the intended flight so you can check in via mobile apps 400 days before! Else pay RM10 extra!